Pompeo warned there would be no US reconstruction aid for areas controlled by Syrian President Bashar al-Assad until Iran and its proxies had left. He also criticised ex-President Barack Obama's Middle East policy, saying he had made "dire misjudgements". 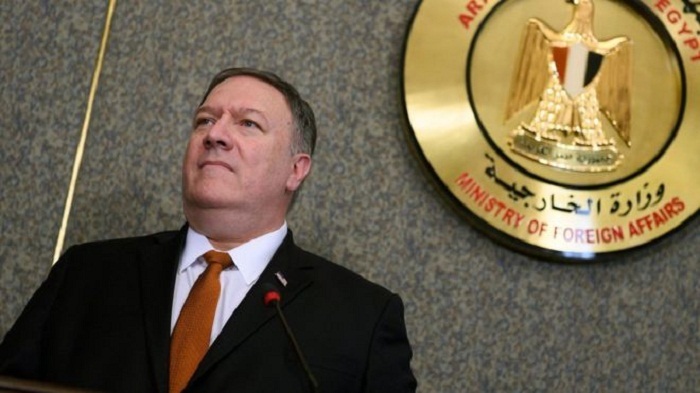 Pompeo was speaking in Cairo three weeks after President Donald Trump said US troops were pulling out of Syria. Pompeo, who has been seeking to reassure allies following Trump's surprise announcement, said: "America will not retreat until the terror fight is over. We will labour tirelessly alongside you to defeat Isis [the Islamic State group], al-Qaeda and other jihadists that threaten our security and yours." He said that the US was a "force for good" in the Middle East, adding: "Where America retreats, chaos follows." On Thursday, Pompeo said: "We will not ease our campaign to stop Iran's malevolent influence and actions against this region and the world." Iranian Foreign Minister Javad Zarif mocked Pompeo's speech, saying that wherever the US interferes, "chaos, repression and resentment follow". How did Pompeo criticise Obama - and why? Pompeo did not directly name Trump's predecessor. However, he referred frequently to a key speech Obama gave in Cairo in 2009, where he had called for "a new beginning" for the US and the Middle East. Pompeo said: "In this very city, another American stood before you. He told you that radical Islamist terrorism does not stem from ideology... He told you that the United States and the Muslim world needed 'a new beginning.' The results of these misjudgements have been dire." "We were timid about asserting ourselves when the times - and our partners - demanded it," he said. The Trump administration has been critical of Obama's decision to strike a deal to limit Iran's nuclear activities, and had accused him of being too soft on Islamist terrorism, and a poor ally to Israel. National Security Action, a think tank involving many of Obama's former policy advisers, criticised Pompeo's speech. "Together with the broader administration he represents, Pompeo sees Islam as an enemy, human rights as a side concern, and autocrats worthy of embrace," the group added. Mike Pompeo framed his speech as the anti-Obama policy - a return to a strong US that wasn't afraid to help its friends and be more proactive as "a force for good". His argument ignored the fact that Obama's Cairo speech was trying to repair damage with the Muslim world wrought by the wars of George W Bush. Nor did it signal a new interventionism: Pompeo insisted President Trump was committed to fully dismantling Islamic State despite his decision to pull US troops out of Syria, but wanted partners play a bigger role. In essence his speech was a clear declaration that the Trump administration's top priority would be to counter Iran, as well as protect Israel, and suggested that would be the benchmark for judging America's still largely authoritarian Arab allies. In December, Trump said he was withdrawing all remaining troops because IS had been "defeated", adding "they're all coming back and they're coming back now". Since then, US officials have appeared to row back slightly on the decision. Trump said the troops would be pulled out "slowly", while National Security Adviser John Bolton said the withdrawal would depend on certain conditions. Analysts have described the administration's Syria policy as "messy" and confusing for allies. Pompeo's Thursday speech appeared to be an attempt to reassure partners, while also reiterating Trump's decision to pull out troops. "President Trump has made the decision to bring our troops home from Syria... but this isn't a change of mission. We remain committed to the complete dismantling of the Isis [IS] threat," he said. Other stops in Pompeo's Middle East tour will include Saudi Arabia, Bahrain, Qatar, and the UAE.